I listened to the Lucky Mojo Hoodoo Rootwork hour this past Sunday and Miss Cat talked about a new Block Buster Line from Lucky Mojo. I am very interested in performing a Block Buster Spell for myself. 1) How is a Block Buster different from a Road Opener? 2) How should I perform a Block Buster Spell? 3) What herbs, mineral, or animal curios are good for block busting? 4) What day of the week would be best to work? 5) What moon phase would be best? 6) What time of day? (or night)? Thanks so much for your assistance. "mwah!" (1) A Road opener opens doors. A block buster knocks down all obstacles. BOOM! It's the difference between opening each door with a key or just throwing a bomb out and knocking all the doors down. Thanks for the explanation Miss Aida, that really helps to clarify things. You are a very good teacher! I feel like I know exactly what the difference is from your very succinct and concise advice. Thank you so much for that. The Block Buster line of goods was introduced at the Hoodoo Heritage Festival on May 3-4, 2014, with a hand-out flyer that explained the difference between Block Buster and Road Opener, and also contained spells for both. You should be able to order all of the Block Buster items -- oil, herb mix, sachet powders, incense powders, bath crystals, and candle -- from the shop and when you do, ask for the Road Opener / Block Buster Flyer to be included with your products. It is free. The Block Buster products are online now. There is a wonderful writeup here http://www.luckymojo.com/blockbuster.html . It contains a really great spell. For the bath portion it says to pour from the neck down. I assume because of its "fiery nature" you do not want to pour this over your head. I just read the spell for blockbuster and am now eager to start my work, just one problem, my order hasn't arrived yet. Anyhow, I've been waiting for LM to get a blockbuster line after reading so much about it elsewhere. Just wasn't ready to try anyone else. Now I don't have to . I was just pouting about the time I noticed LM didn't have a Blockbuster line! I'm taking this as a sign! Block Buster does not care what brought the problem into existence or how it is being sustained -- it just blows everything in your path to Kingdom Come and makes a way where there was no way. Could you use this block buster oil to anoint yourself such as you do with road opener or VanVan oil? My second question is I have a head board that has two cubbies or shelves spaces in it.. Is it ok to store the oils in a basket that are next to or behind my pillow or is it okay to store them in a dresser drawer? Can they be located in front of or next to your computer/monitor/speakers? 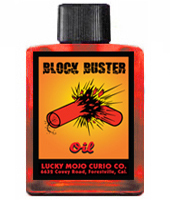 The more appropriate use for the Block Buster oil would be for dressing candles, objects, or in a bath. If I were you, I'd use the Block Buster oil on a candle in a block-busting ritual, THEN anoint myself with Road Opener and/or VanVan oils. You can store your oils anywhere that works for you, as long as you keep them out of extreme heat or prolonged, direct sunlight. They'll keep longer that way. I'm wondering about a Block Buster Mojo Hand... might that be in the works for LMCC too? If Miss cat said to use red, that's what I would use. There is no authority (in my humble opinion) more knowledgeable than Miss cat. I just read the announcement of this new line in the newsletter! You have no idea how excited I am - this is a very useful formula and one sorely needed. I'm so happy Lucky Mojo added this one. Taking a 13 th herb bath or uncrosing bath before the block buster spell is it a good idea ? Sure, goldentouch, doing an uncrossing would be good before Block Buster work -- not necessary, but if you were crossed up, it would help. So excited for my next package. I ordered almost the entire line of Block Buster products. The only thing I did not get was a candle set on the altar and looks like that link is going live today. I have been checking on it almost everyday. And today I noticed the stock photo has been replaced with the beautiful new label. Yea! http://www.luckymojo.com/blockbuster.html . When doing Block Buster, should you tackle one problem (ex. job, health, relationship, housing, etc.) at a time? I'm excited too and just can't wait to get my order!!!!!! Every root worker is different. But I personally like to tackle one problem at a time. can i use a dressed candle with block buster oil to bring me success in my career? would one say that block buster is perhaps stronger than road opener? I read the metaphors that described block buster as making a path through a mountain and road opener is taking a machete and cutting through overgrowth. Also, I am moving your query to the blockbuster thread. would a block buster candle at the MISC be good for gaining financial independence as in a full time job? i want to become a full time employee at my job but it still has not happened. could this candle help and finally make a way? what candle could be added to help this one along? thank you for your reply. i have used steady work many times and it always works but temporarily. i get lots of hours at work after i use this candle but it never lasts, the hours always go back to my normal part time hours. i want something that will make this permanent. this is why i was thinking of using block buster to make a way in a place that there isn't right now. can block buster be used in love situations to make a way? Dream90, just a fyi. I ordered the fixed candle and it is orange. It does have red glitter though. I recieved a flyer for a fantastic Block Buster spell created by Apollo Dark. I wanted to know what would be the best day and under what planet to perform this spell and give it some added kick ? BlakPrincessUK, I think that the type of Block you are Busting will also need to be taken into consideration. For example if communication is an issue Monday might be the best day, but if it is a love situation, Friday might be better. Miss Aida gave you an excellent link for more information. Hi, I've read everything about the BlockBuster, but it's not saying if it should be done while decreasing or increasing is required. For me, I think that it should be used during waning moon, down hands movement, etc... to remove obstacles. Right?! Also I'm wondering if can be used to "clean" someone from someone's else influence if I don't know how he was hoodooed in the first place, so planning to remove/explose all obstacles to his dependability on the other person an okay way to use these? P/S Thank you LM for providing us with such a wonderful opportunity to advance quickly towards our goals! Impatient to try it! Are blockbuster vigils going to be available for lighting in the church? I was just about to have one set but I didn't see it listed. Personally I would use it during the waxing moon because it is opening the paths. But, I see your point also. Nevertheless, some rootworkers don't work with moon phases and heir magic is effective. I would perform the spiritual cleansing and then the blockbuster! Dragonfly72 wrote: Hi, I've read everything about the BlockBuster, but it's not saying if it should be done while decreasing or increasing is required. For me, I think that it should be used during waning moon, down hands movement, etc... to remove obstacles. Right?! I am purchasing the Blockbuster supplys for the spell mentioned on this web site. It mentions dressing a red jumbo candle with the oil and writing on the candle your wishes and then it proceeds to tell how to make rolled candle with the herbs. It doesn't say what to do with the red jumbo candle. Do I light it when I light the rolled candle? or when? Or do I light it at all. I'm not sure. I'm not sure why the reply was edited into my post, but I called and asked. I was told to order a road opener and tell them in the message box on paypal that it should be a blockbuster. Kyldy, you use the red candle to roll in the herbs. kmew1315 wrote: I'm not sure why the reply was edited into my post, but I called and asked. I was told to order a road opener and tell them in the message box on paypal that it should be a blockbuster. It does for me, I was looking for the same thing myself!! Thank you so much! I am THE most technically challenged Moderator on the forum. So, hopefully, someone will eventually fix my error. And THANK YOU so much for telling us how to get a Blockbuster candle set on the MISC altar! I figured it was something like that. I actually didn't see the reply at first because I saw my post and skimmed over it because I already know what I said. I saw it eventually though so no harm no foul. And you're welcome to everyone who was helped by that. I should have one starting tomorrow.... or I guess by now it's today but I'm a night owl (I know they don't always light the next day but I requested that if possible they could so I could have it going before Wednesday for a specific thing). So hopefully some blocks will be busted. yes, they told me to write that its meant to be a blockbuster candle in the message section, and to call the MISC to be sure they dont overlook this switch. So there is a block buster question here just be patient lol. So I've been doing love work on someone and getting great signs, a very positive reading from a misc candle burn and a bit of movement. Then I had a setback and took it in stride as just her putting up resistance. Then this weekend I found out what was really going on with the setback and was crushed. I started losing faith in all this and just went with a last ditch block buster to remove the blocks and a st expedite with a cut off date (a month from now. Nothing too extreme) to see what happens. Then today I got a burn report from a candle I lit before this happened. It's weird to have faith restored via a negative result but this reading was so spot on, it's uncanny. The glass of this candle is clear with a thick band of wax remaining in the bottom of the glass. These signs suggest that there is some resistance connected to this working, likely due to unresolved issues from the past. More work may be needed to break these barriers. The candle also needed to be re-lit once, marking a delay in the outcome that you desire. The issues I mentioned before were that she's begun talking to her ex again. Definitely "issues from the past." So my question is whether this is a block that can be busted via a block buster candle? I put in my petition for any physical, mental, emotional and spiritual blocks to be destroyed. And of course the question is why I didn't do a break up candle instead. A few reasons. 1. This was a last ditch effort and I wanted to eliminate every obstacle. 2. He is a liar, a thief and a cheat. She knows he is all these things and her even talking to him again let alone "talking" to him is such a bizarre and sudden turnaround that I wonder if he's done any magic himself that needs to be taken care of that won't via a break up candle. And 3. I don't know much about him. I know his first name but not his last (and it's a very common first name). I don't know his birthday. I think I know the year. I might know the month but I'm not sure and I have no idea on the date. I have no picture of him other than one where I think he might be in the background. He has almost no online presence and even if he did, I don't know his last name to find him. Actually reading all this over before posting this, the exact wording is "More work may be needed to break these barriers." That sounds like block buster to me. So maybe this is the right course. I don't have the money at the moment to hire a root worker to do anything too involved but I really wish I could. I would have a "run" of candles" set for you. So, you order a Blockbuster candle to be lilt and then tell them that when that candle has burned out, to light another r candle of the same (that you had ordered before). The original candle was a come to me. I already ordered the block buster. It was before getting this report. Should I wait a week or so and order another come to me? Wondering if BlockBuster may be used to remove all Hoodoo work put on someone in order to help him evolve and find real happiness??? kmew1315 wrote: The original candle was a come to me. Actually would it be better to wait until I get the candle report? After all if the blocks weren't busted, it would change my plan of attack. That BLockbuster line is really great. Hope you enjoy it as much as I have! That's a little bit of complicated question. It depends on the nature of your work. Some rootworkers will add just a tiny little drop (or even half of a drop), to other oils if there's a complete block in the area of need. So, again, you know the nature of your work. But, if you're having troubles in many areas, I suggest that you just do a blockbuster spell (alone) first). And this link will give you lots of help. I just performed a Blockbuster spell. Worked very well! So, I'm excited for you! I learned this is an oil to be careful with. I did an orange seven day candle on myself and used Blockbuster oil and then the Blockbuster herbs on it. When the candle was done the glass was crystal clear. Right away an argument over something so petty caused a fight between myself and a family member. Sides were taken and and four people turned their back on me. Now that things have settled I realized I'm better off with out those four people and they were a blockage for me. Not what I expected at all from using this oil, so be careful using it. Miss Cat, I got my last order with Blockbuster in it, can I blend it with the other Uncrossing products like Jinx Killer or alone is okay? Yes, ANSUZEIHWAZ, you can use it alone or blend it. It can also be belded with money oils to blast away money blockages, or with love products, to blow apart love troubles. .